I’ll admit four years ago, I didn't know a single macrofungus. I had never tried this foodie trend at the grocery store called an oyster mushroom. I might not have known a crusty red splotch on a stone was likely a lichen (and part fungus). But as a recent transplant to the Washington, DC, area, I knew needed a hobby and some friends, and I knew I wanted to get back into the woods and do something meaningful. How is it that today I'm editing McIlvainea? For me, and I suspect for many NAMA members, science is the answer to many everyday challenges. Congress not doing such a good job? There’s got to be a study to fix that. World catastrophe? Cash crop wiped out? Not enough organs to go around? Call a scientist or bioengineer or research surgeon. Even journalists and computer programmers apply tenets of science to hone their crafts. Of course, science alone can’t solve everything, but it’s responsible for many of our society’s greatest successes and yet remains one of our saddest deficits. Luckily, in my search for meaning (science) and fun, I stumbled into mycology. I have to hand it to you guys, mycology is not only a compelling and enjoyable discipline but also an open-source DIY community where amateur contributions are welcomed and celebrated. We might be a little rough around the edges, but from our association’s foundation in 1959 as the People-to-People Committee on Fungi, our mission has been to put the power of compelling science into the hands of an energized public. What better mission could a lifelong writer and editor sign on to? I’m proud to continue that legacy by working on McIlvainea. I hope you’ll do your part as a NAMA member by renewing your commitment to mycology—the science, that is. 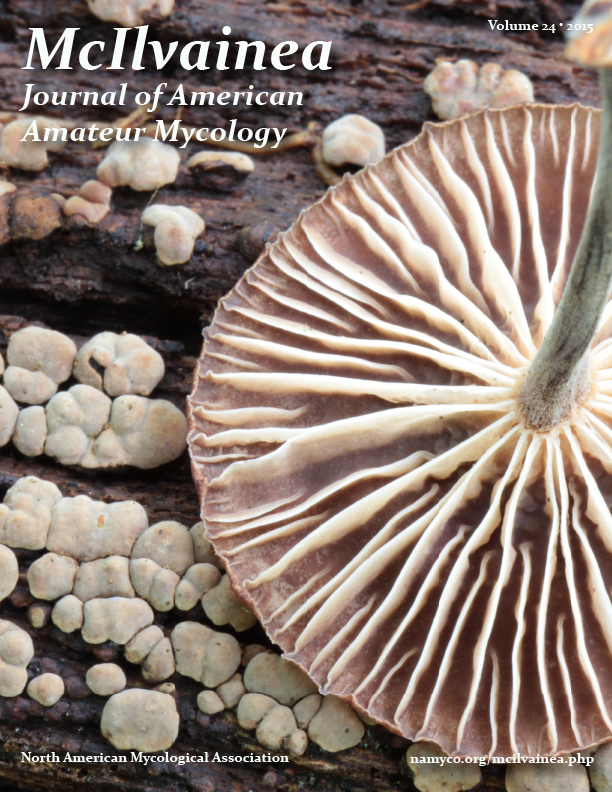 When we convene at the North American foray later this year, our leadership will present (and later publish in this journal) clear guidelines so mycologists everywhere can collect reliable data about fungi as part of the North American Mycoflora Project. We will let you know where to start and how to carry your momentum. All we ask is that you join us. Catalogue them all! Or at least set an ambitious goal for yourself or your local NAMA-affiliated club. New research has shown there’s really no limit to scientific exploration in kingdom fungi, even in North America. So you’ve got no excuse not to go beyond mycoflora and ask more of your mushrooms. Let an afternoon's fungi-themed thought experiments get out of control. Start your brainstorm session off by reading some of the tragic and strange stories of poisonings from 2014 in this year’s NAMA Toxicology Committee Report — North American Poisonings. Or see which mushrooms from our Voucher Report for the 2014 Patrice Benson Memorial Foray grow in both the Cascades and your own backyard. Ask why. Let your questions grow. Then weed them back to a manageable size. Borrow a lab report from a high school student and tinker with a fungi-related “science project.” Experiment. Learn. Practice. Develop your project. Have someone critique it. Is your methodology sound? Is your idea original or does it help develop an emerging body of knowledge? Polish it up. Publish it here! Impress your nonmycological coworkers with your passion. All along, know you’re contributing to a world where adults are science literate, children never lose their inquisitiveness, and everyone can make contributions to science.